Every day thousands of people broadcast their gaming live to audiences over the internet using popular sites such as Twitch, which reaches more than one hundred million viewers a month. In these new platforms for interactive entertainment, big esports events featuring digital game competitors live stream globally, and audiences can interact with broadcasters—and each other—through chat in real time. What are the ramifications of this exploding online industry? Taking readers inside home studios and backstage at large esports events, Watch Me Play investigates the rise of game live streaming and how it is poised to alter how we understand media and audiences. Through extensive interviews and immersion in this gaming scene, T. L. Taylor delves into the inner workings of the live streaming platform Twitch. From branding to business practices, she shows the pleasures and work involved in this broadcasting activity, as well as the management and governance of game live streaming and its hosting communities. At a time when gaming is being reinvented through social media, the potential of an ever-growing audience is transforming user-generated content and alternative distribution methods. These changes will challenge the meaning of ownership and intellectual property and open the way to new forms of creativity. 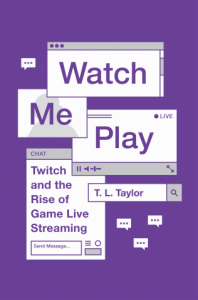 The first book to explore the online phenomenon Twitch and live streaming games, Watch Me Play offers a vibrant look at the melding of private play and public entertainment. From Princeton University Press. Also available at Amazon and your local bookseller. See watchmeplay.cc for more info. “Competitive video and computer game play is nothing new: the documentary King of Kong memorably portrays a Donkey Kong player’s attempts to achieve the all-time highest score; the television show Starcade (1982–1984) featured competitions among arcade game players; and first-person shooter games of the 1990s became multiplayer through network play. A new development in the world of digital gaming, however, is the emergence of professional computer game play, complete with star players, team owners, tournaments, sponsorships, and spectators. 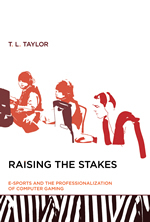 In Raising the Stakes, T. L. Taylor explores the emerging scene of professional computer gaming and the accompanying efforts to make a sport out of this form of play. In the course of her explorations, Taylor travels to tournaments, including the World Cyber Games Grand Finals (which considers itself the computer gaming equivalent of the Olympics), and interviews participants from players to broadcasters. She examines pro-gaming, with its highly paid players, play-by-play broadcasts, and mass audience; discusses whether or not e-sports should even be considered sports; traces the player’s path from amateur to professional (and how a hobby becomes work); and describes the importance of leagues, teams, owners, organizers, referees, sponsors, and fans in shaping the structure and culture of pro-gaming. “Taylor’s book is a valuable piece of scholarship that lays the groundwork for further investigation into all aspects of video games as sport and players as athletes.”—Steve Jacobs, American Journal of Play. “Ethnography and Virtual Worlds [co-authored with Tom Boellstorff, Bonnie Nardi, and Celia Pearce] is the only book of its kind–a concise, comprehensive, and practical guide for students, teachers, designers, and scholars interested in using ethnographic methods to study online virtual worlds, including both game and nongame environments. Written by leading ethnographers of virtual worlds, and focusing on the key method of participant observation, the book provides invaluable advice, tips, guidelines, and principles to aid researchers through every stage of a project, from choosing an online fieldsite to writing and publishing the results. 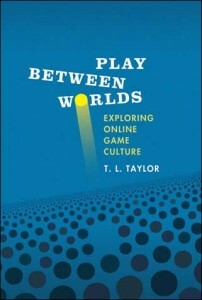 “In Play Between Worlds, T. L. Taylor examines multiplayer gaming life as it is lived on the borders, in the gaps, as players slip in and out of complex social networks that cross online and offline space. Taylor questions the common assumption that playing computer games is an isolating and alienating activity indulged in by solitary teenage boys. Massively multiplayer online games (MMOGs), in which thousands of players participate in a virtual game world in real time, are in fact actively designed for sociability. Games like the popular Everquest, she argues, are fundamentally social spaces.